Walter’s friendship with Whistler ended sometime in the early 1880s when Joseph Pennell, Whistler’s friend and biographer, damaged his reputation by accusations of Whistler painting some of his canvases. Many of Greaves later works, unlike his crude early work, share a style peculiar to Whistler. According to the Centre For Whistler Studies, Walter spent many years in neglect and poverty. 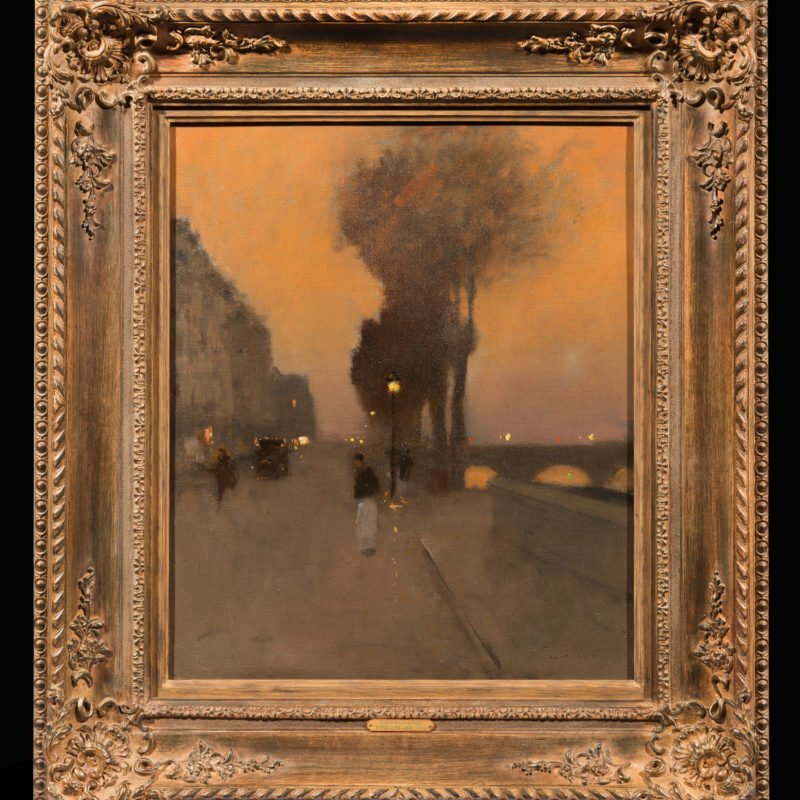 He was re-discovered by William Marchant, proprietor of the Goupil Galleries, who put on an exhibition of his work in 1911. But after Pennell’s accusations, the final eight years of Greaves life were spent as a Poor Brother of the Charterhouse. Walter Greaves exhibited in London at the Grosvenor Gallery and the Goupil Galleries, as well as at the Glasgow Institute of the Fine Arts, Walker Art Gallery in Liverpool and Manchester City Art Gallery. His work is in the collections of the Whistler House Museum of Art in Lowell, MA; the Museum of Fine Arts in Boston, MA; the Cleveland Museum of Art in OH; the Tate Gallery in London; the National Portrait Gallery in London; the Museum of London, UK; the Courtauld Institute, UK; the National Gallery of Canada, Ottawa. The Greaves bothers, Walter and Henry, were the sons of a Chelsea boat-builder who had rowed Turner on the Thames, and owned Greaves’ Boatyard in Chelsea. When the brothers met Whistler soon after the American’s arrival in Chelsea in 1859, they – particularly Walter – became close friends for at least a decade. Walter rowed Whistler on the Thames, usually at night when the noxious but beautiful river was quiet, and assisted in Whistler’s studio – learning first how to etch, and then how to paint. Their close association has led to confusion; some Whistlers have Walter Greaves’ hand in them, and it is suspected that some paintings by Greaves have Whistler’s hand in them. Whistler had wanted to catch ephemeral effects of light and weather, working out-of-doors in oils since the early 1860s, but did not find a formula for doing so until the early 1870s, and then quite simply by using experience and memory. He would go out on the river, memorising lights, textures and colours. Having previously prepared his canvases and laid out his colours, immediately on his return from he river he was able to paint his pictures quickly in one sitting, with great spontaneity. In this process he was certainly aided and abetted by Greaves. By the late 1870s, Whistler had dropped him, perhaps because the increasingly not-so- humble boatman’s presumption to share in Whistler’s growing fame and success, but also partly because of the comparative sophistication of Whistler’s new friends as he became famous. After Whistler’s death in 1903, Greaves helped Joseph and Elizabeth Pennell with their Life of Whistler (1908) – but when in 1911 he had a very successful exhibition of his own pictures at the Goupil Gallery, he included a ‘Nocturne’ which he wrongly claimed (either deliberately, or in confusion, or a bit of both) to have first exhibited in 1862, earlier than any by Whistler. The irascible and vindictive Pennells turned on him with letters to The Times accusing Greaves of plagiarism and discrediting him beyond redress; Greaves’ reputation has never recovered. When a catalogue (it did not not claim to be full) of Whistler’s paintings was published in 1995 (James McNeil Whistler, Dorment and MacDonald), at last a degree of rigorous scholarship was applied to this difficult area, and many paintings previously attributed to Whistler were quite rightly ruled out. A proportion of these were actually painted by Walter Greaves, who had benefited during his lifetime from his association with the master, but had destroyed his own legacy by presuming too much. Greaves, the lesser artist, has become Whistler’s dustbin, but at his best his pictures are arguably better than Whistler’s at their worst.